As followers of St John Bosco we are committed to helping youth build a better future. Education and training is central to the true development of each individual to achieve their full potential. Our Pacific neighbours in Samoa and Fiji seek assistance and support, we hope you can help. Don Bosco Technical Centre, Alafua – which caters for young men (aged 16-22), who have not been able to complete mainstream schooling, due to poverty, prior drop-outs or other serious family and social problems. Don Bosco Co-educational Colleges & Vocational Centre, Salelologa - offer co-educational placements to over 300 students, many of which live in remote villages and can only attend by catching the school bus. Both schools require ongoing support to cover running costs, teacher’s salaries, maintenance and workshop materials. In Fiji the Salesians have a House of Studies for students mainly from the Pacific who attend the local seminary and teachers’ college. For these Salesians the “outreach” to date has been focused on local primary schools, an orphanage and nearby villages. Currently, the Salesians are in the process of constructing a large Multi-Purpose Community and Youth Centre, the first of its type. 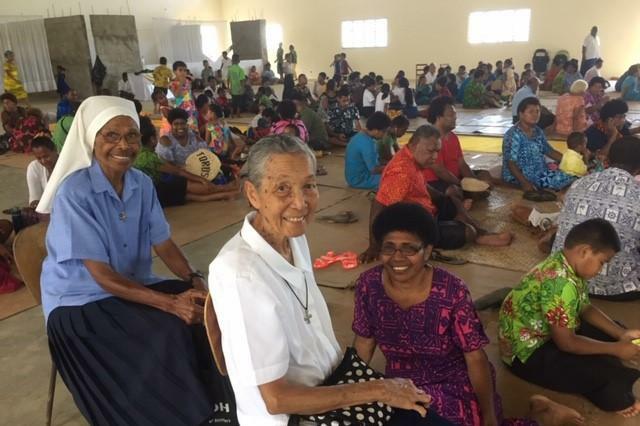 Fr Mikaele Leilua, Parish Priest, explains , “The multipurpose hall will draw youth off the street, offer them quality time with their friends in an environment where life skills, teamwork, games, sporting facilities and educational programs will keep them away from disruptive and unlawful behaviour. A positive environment helps to build confidence and assist in employment opportunities for a variety of pathways; volunteer work, vegetable growing projects or receive support and encouragement to pursue full or part time training. We are your hands reaching out to the less fortunate… Can I count on your support today? I hope I can. Even the smallest gift makes a significant difference.